When Kyle Thompson (Virginia Polytechnic Institute, 2019) stood before our sacred shrine at the Iota Zeta Chapter’s most recent initiation it was unlikely he knew he would become part of Delta Tau Delta history. But by taking his Oath and assuming his badge, Thompson did just that. On April 21 Thompson became the 10,000th initiated member of Delta Tau Delta in the 2015-2016 school year. He joins 9,999 other undergraduate members of Delta Tau Delta who are part of the largest single-year undergraduate membership in Fraternity history. Though moved by his place in history Thompson was just making his collegiate experience feel a little more like family. “I found a bunch of guys that I liked. I didn’t know they were in a fraternity, but they ended up being Delta Tau Deltas. They told me to come out to rush. I decided to take them up on it and I just liked everyone there,” said Thompson. The origins of the Fraternity’s rapid growth came about long before the Fraternity was even a thought for the young initiate. In the year 2008, when Thompson was only 12 years old, the Fraternity made a strategic shift to allocate more resources toward membership recruitment. At the time the Fraternity undergraduate membership consisted of fewer than 6,500 members. To become a significant player in the Fraternity world, Delta Tau Delta needed a larger undergraduate presence. “I am incredibly proud of our undergraduate brothers for hitting this milestone of growing Delta Tau Delta to the largest it has ever been. For me, however, it is not about the number. Today we are celebrating that we have more men on more college campuses that are committed to lives of excellence. 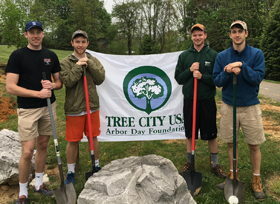 These men are making a difference in society and in each other’s lives as one brotherhood,” said International President Jody Danneman (University of Georgia, 1988). The Fraternity rapidly experienced growth during the next four years. At its most recent strategic planning session the Arch Chapter made the bold decision to aspire even higher. In 2012, the Arch Chapter set the audacious goal to attain an undergraduate membership of 10,000 members no later than the end of the 2018 fiscal year. By employing a two-prong strategy of aggressive new chapter expansion and providing support and guidance to existing chapters, the Fraternity arrived at its goal more than two years ahead of schedule. Since the growth strategy launched in 2008 the Fraternity has colonized 39 chapters and seen its average chapter size grow from 56 to 73 – an average which is first among all college fraternities. Still, the real impact isn’t in numbers or in dues or in prestige. The real impact is in the thousands of additional members for whom Delt values will become a cornerstone. For men like Thompson the Fraternity is a great place to socialize with men of superior character. “All the values of the Fraternity make a person of integrity. That can only help you in the world,” said Thompson.